A modern two bedroom first floor apartment located in a popular residential area of Penryn close to town and University. Well equipped accommodation benefitting from lovely views across town to Penryn river with allocated parking.No onward chain. THE LOCATION Calver Close is a development completed by Wainhomes no more than ten years ago which has proven extremely popular ever since and with very good reason. What the scheme offers is cul-de-sac peaceful living whilst being located centrally to all of the amenities that town living brings. Penryn is a historic and ancient market town with an active community and excellent everyday facilities including a nursery, primary and secondary schools. The town enjoys good communication with Falmouth via its bus service and train station, which links to Truro city and mainline Paddington. Penryn is enjoying something of a renaissance witnessed in the regeneration and development of Penryn's inner Harbour area providing riverside accommodation and extensive and exciting dining options. Penryn Campus is occupied by both Falmouth and Exeter Universities sharing buildings, facilities and services as part of the combined universities in Cornwall project; this recent transition into a University town is creating a real 'buzz' for the area. Falmouth town (approximately 2 miles) provides comprehensive shopping, schooling, business and leisure facilities and was recently voted 'the best place to live in the South West' in the prestigious Sunday Times guide. THE PROPERTY An impressive first floor apartment, very well presented throughout and with tenant in situ or available with vacant possession as of June 2019. Accommodation is light and airy across the two double bedrooms, bathroom, open plan living area and kitchen with many rooms benefitting from lovely views to Penryn river and Falmouth. Complete with gas central heating, double glazing and allocated parking. This is a perfect opportunity for those seeking a low maintenance 'base' in the heart of the town - an excellent first-time purchase or profitable investment. COMMUNAL ENTRANCE Through communal door shared only by three flats, up turning staircase to first floor, plenty of natural light with window to front aspect. HALLWAY Through front door into hallway providing access to living room, bathroom and both bedrooms. Carpet, radiator, lighting, power points, thermostat heat control, intercom system. Good sized storage cupboard. KITCHEN 11' 3" x 5' 11" (3.45m x 1.82m) Fully fitted kitchen with window enjoying the view as well. Vinyl flooring, lighting, range of base and eye level units, worktop, tiled splashback, one and a half basin and drainer, oven, grill and four ring gas hob with extractor above, under counter fitted washing machine, space for tall fridge/freezer, cupboard housing Ideal logic combination boiler. BEDROOM ONE 11' 4" x 10' 7" (3.46m x 3.25m) Great sized square double bedroom with window enjoying the views. Carpet, radiator, lighting, power points, phone line, TV point. BEDROOM TWO 10' 0" x 9' 11" (3.07m x 3.04m) (Measured at widest points) A small double or large single bedroom with window to front aspect. Carpet, radiator, lighting, power points. 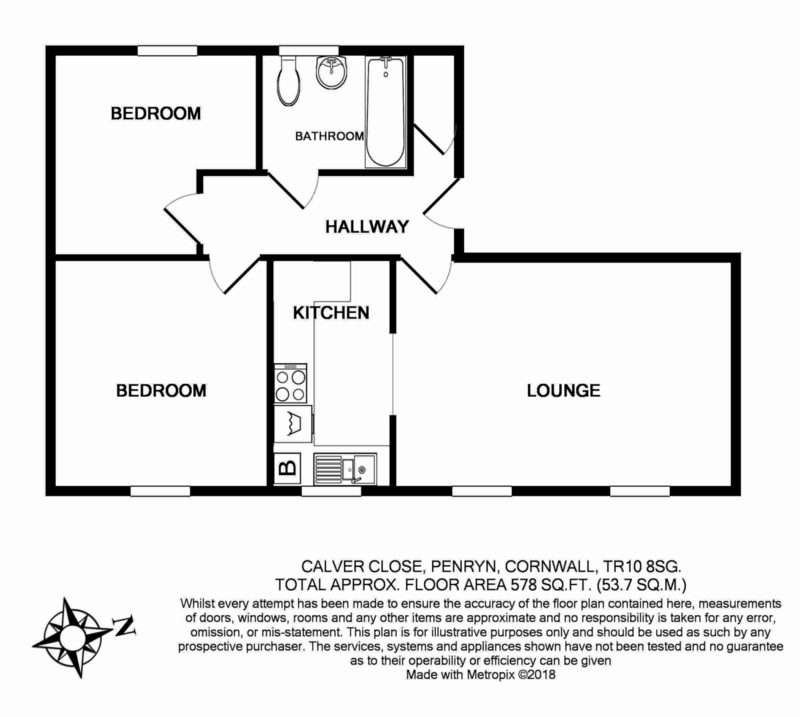 BATHROOM 7' 4" x 5' 8" (2.25m x 1.75m) Nice wide bathroom with window to front aspect, vinyl flooring, heated towel rail, lighting, extractor, shaver points, low level flush WC, pedestal wash basin, bath with shower over, tiled surround and glazed screen. PARKING Allocated parking for one vehicle in front.